Shoes for S/S 2014 #weloveyou | StyleAble Fashion For Everyone! That’s not all. I know alot of you prefer comfort, so if you want something that is only one step away from being completely bare foot, then you will be thrilled – the humble gladiator sandal is back again too. 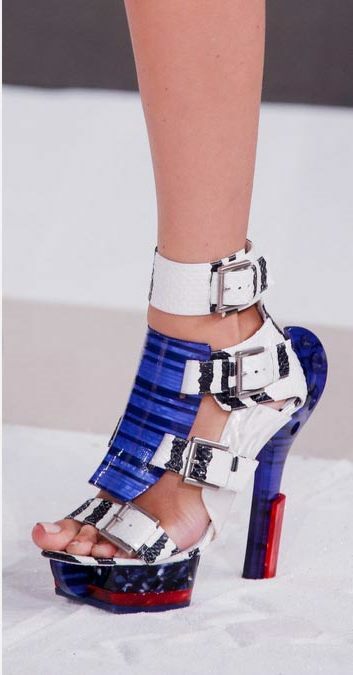 However, this time gladiator sandals are freakishly embellished (think jewels à la Katy Perry’s grill in her Dark Horse video). 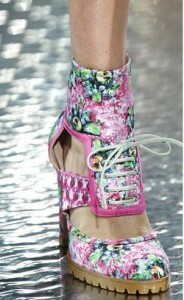 In fact, embellishments are a big part of this season’s shoe collection. Gladiators will also come with killer heels of course, but regardless of the height you choose, jewels, tassels and flowers will be inescapable over the next few months, see our article on bag trends for more on this. So, expect the unexpected – a twist on the classics if you will? When in doubt, opt for the following: Wildly embellished gladiators, enhanced and neon loafers, cutout wedges and brogues, sleek pumps and clunky flatforms. Oh and if none of these appeal to you, there’s always the classic option: stilettos. Sky high stilettos are HUGE right now (literally), not only that, but the heels are freakishly skinny. These are not shoes for the feint hearted so beware, the potential for injury is almost as high as the heel itself. Whatever you choose to wear this spring/summer, there’s something to suit every taste, from the pretty to the practical. Want to know more about what to expect this season? Check out our list of top trends for Spring/Summer 2014!